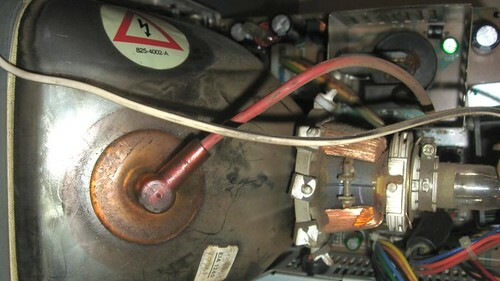 HiR Information Report: Flyback transformers and CRT discharge. OF DEATH. Last week, our friend Mike was attempting to power an ionocraft with the flyback transformer from an old 15" Gateway CRT. There was a bit of fear (or overdeserved respect) for the high voltage source. I gave a little quick lesson on how to discharge the CRT before diving into the project, but I figured it deserved a little more detail, and that you guys would at least find it interesting. 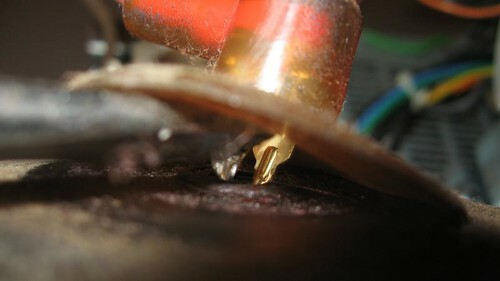 While it's true that you wouldn't want to simply grasp the exposed anode and yank it off of the CRT, it seems there's a lot of misinformation and urban legends around flyback coils, CRT discharge, and sudden death. People make it sound like you'll surely shatter the monitor if you don't electrocute yourself first. Legend has it that CRTs are fragile, and one false step can turn them into a deadly fragmentary grenade. First, let me state that the "shock" factor of a monitor or CRT comes mostly from the fact that the CRT itself acts as a giant capacitor. A capacitor is simply two conductors separated by a dielectric. It so happens that the mesh grid, thick glass, and other energized components in a CRT make a pretty good capacitor which can hold a charge for a long time, even when it's not powered on. That part is NOT a myth. Even if you do get bitten (I've been, only once, and yes, it hurt), the chances of a lethal electrocution are slim to none, so long as you're not touching an ENERGIZED HV coil, such as if the power supply for the monitor or TV is turned on. As for the "explosion" or "implosion" hazard of CRT monitors? All modern monitors are designed with a mesh or metal layer inside that keeps the CRT from rapidly failing. Frogman and I have tried breaking many CRTs of various sizes and we've never seen any spectacular failures before. The glass is very thick, and you're most likely to break the little vacuum seal nub at the CRT's tail, or shatter the narrow neck than any thing else. It'll simply hiss and be done with. It's pretty boring, really. It's not a bad idea to wear safety glasses when handling a CRT, though. They're made of glass, which can chip even if the hazard of implosion is virtually nil. 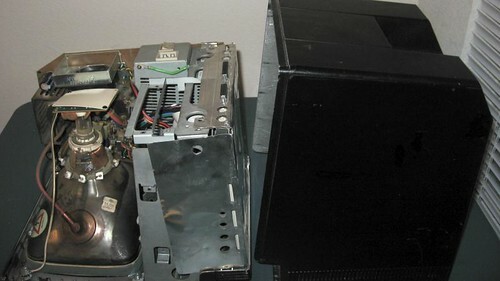 Still, one should remain careful when handling CRTs or otherwise poking around inside devices that use high voltage transformers. As always, we can't be held responsible for your mishaps, and a live flyback transformer is nothing to treat lightly. Some can put out tens of thousands of volts, and most aren't current-regulated. They can cause harm. I'll use my Mac SE/30 (the Blackintosh) for an example of how to safely discharge a CRT. First, you want to make sure it's unplugged and powered off before you even open it. On the left, the large suction cup device is the anode. It runs back to the high voltage flyback transformer seen toward the upper right of the photo. This Mac hasn't been powered on in a few months, but the CRT may still hold a capacitive charge. The HV transformer in this model might put out 10kV when energized, but only a fraction of that charge, if any, may remain in the CRT itself. The way to discharge it is to take a jumper wire, attach one end to a metal screwdriver with a well-insulated handle, the other end to the chassis ground of the monitor. 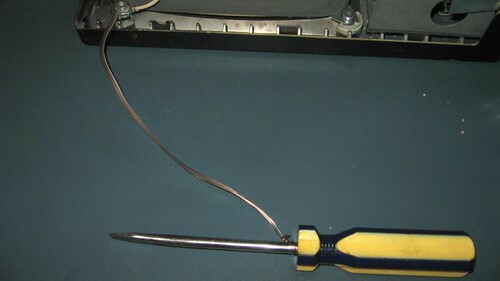 You can do this with an alligator-clip jumper wire, or just grab any old wire you have, strip the ends, and make sure it's connected to the chassis and to the metal screwdriver shaft. Gently pry up the edge of the cup. 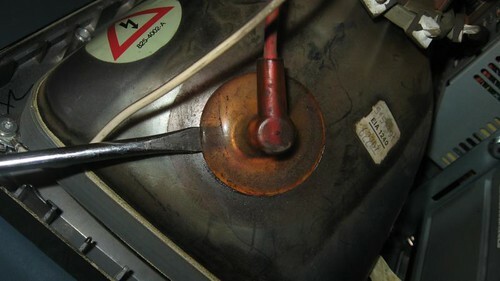 Pry up until you can see the anode plugged into the body of the CRT. And then, make sure the screwdriver touches the anode. You're done. 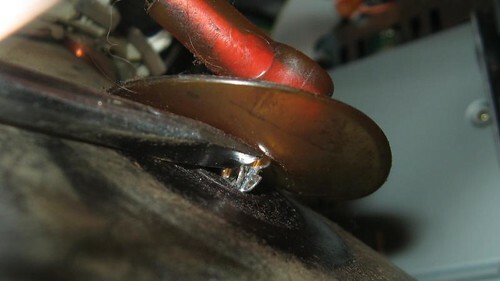 If you must remove the anode, you can keep using the screwdriver to pop the anode out of the CRT housing. At this point, you can touch the anode, the flyback transformer and the CRT without fear of being zapped. Of course, I wouldn't recommend intentionally touching the HV gear unless you absolutely must (for instance, to replace a damaged CRT or flyback transformer). As a matter of practice, you should just leave the HV stuff alone if you don't have a good reason to be working on it. It's pretty well insulated in newer monitors and TV sets and shouldn't cause you much problem. It's common practice to re-ground the HV anode if you're tinkering with high voltage experiments such as CCCKC's ionocraft. It's not really a requirement though. Chances are, the energy stored between the corona wire and the ground skirt of the ionocraft isn't even noticeable, but better safe than sorry.